A first ever visit to this quality little Samuel Smiths that I didn't even know existed. Having got crowded out of the old bell after just 2 drinks I found myself outside this little gem and immediately wondered why it wasn't as busy as all the pubs in the immediate vicinity. The answer is simple......its a Sam Smiths pub and doesn't cater for the lager and proseco drinking fraternity. 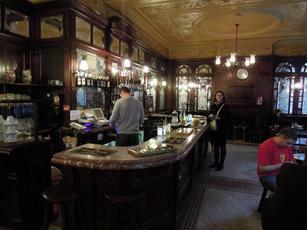 The interior is like a parlour, full wood and etched glass panelled walls with the same behind the bar. The ceiling is also very ornate and is the perfect thing to look at when you're sat on your own staring around aimlessly. Usual Sam Smiths selection and I can confirm that the Old Brewery Bitter was on good form. Nice interior including a marble bar counter top.No real ale.Sam Smith bottled beers,which are very good,but outrageously priced at over a fiver for a bottle of IPA. 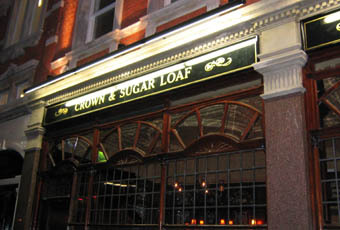 The Crown and Sugarloaf is a small cosy pub tucked away down a side street just off Fleet Street. 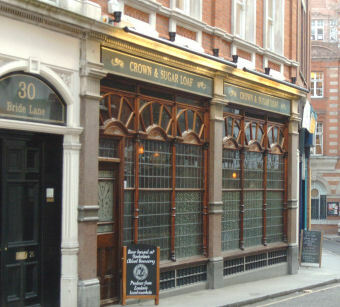 It's one of the smaller Samuel Smith pubs, but still has the traditional look and feel that a lot of the SS pubs have. Due to its size, they don't serve food, but the bar staff are always very friendly, and with an open fire, it is great during the winter. It's also quite a quiet place, so perfect if you just want a pint and a bit of a chat. Whatever you do STAY AWAY FROM THE ALPINE LARGER. Seriously it leaves you with outrageous hangovers. Yet to meet anyone who hasn't suffered a brutal hangover the morning after sipping on a couple of alpines.